With European winter approaching, we decided it was time to bolt once again and spend the Christmas days under a sunny sky, packed with adventures. Two years ago, we took on our first quest to explore South East Asia, visiting Bali, the Philippines and Cambodia. This time we boarded yet another plane with a new destination. From the beginning of November until two weeks after the new year, we had the pleasure to get acquainted with South East Asia’s most narrow-shaped country and its inhabitants. A place where you can’t cross the street without being spotted by local kids to be greeted enthusiastically. Where you’ll find more children on motorbikes than on actual bikes. Where you can hop from mega cities to laid-back countryside in a few hour’s drive. 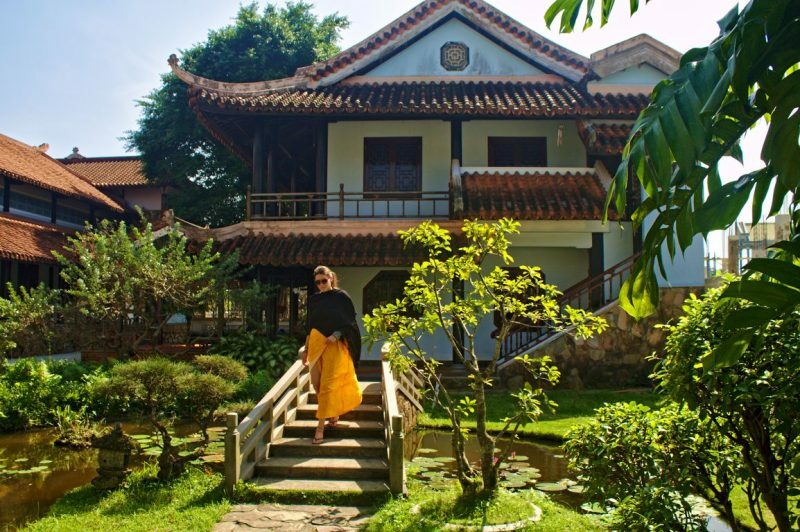 We traveled Vietnam for more than 2 months from North to South, experiencing many facets of everyday life and learning about the rich culture of a country coping with the benefits and down-sides of a fast developing economy. While cities like Hanoi and Ho Chi Minh are booming, there are still many rural places where traditions and handicraft persist. 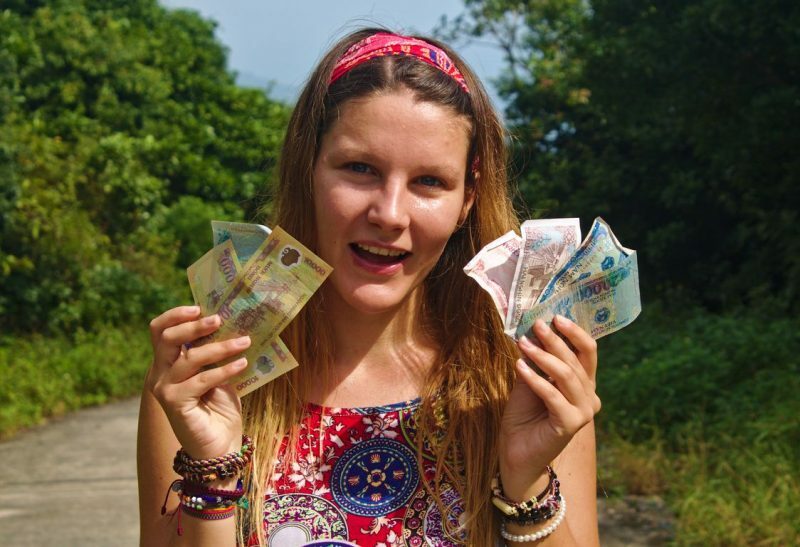 In this guide, we will answer the question: how much does it cost to backpack Vietnam? We have kept a list of all our spendings during our travels which we break down per visited region. We will also mention some general prices and, if possible, cheaper options. Although we travel on a budget, we don’t try to pinch our pennies too extremely and we don’t always choose the cheapest option. If you are planning a trip to Vietnam, have a look at our budget guide and see if a trip here would fit your budget. We don’t usually book in advance when we travel. Sometimes it helps to look around on booking websites to get an idea of the prices. In Asia, we prefer to just walk around and get a good deal while we are there. Due to a new tax law, booking sites now have to pay tax on bookings. Often, this means they’ll show you a good price on the website but then sneak in their own service fee and an extra 10% tax. In some cases, these additional fees cost much more than the room itself. Luckily, you will often be able to make a reservation without paying online – you can pay when you arrive. If you really have to book in advance, just book one night and extend while you are there. Most likely, you’ll get a better price because there won’t be a need for a booking fee. We booked our flights to Vietnam from Aeroflot for €678.88 in total. Our return flights cost $851.32 (€694.19). To be allowed in the country, we need visas. This can be done online. 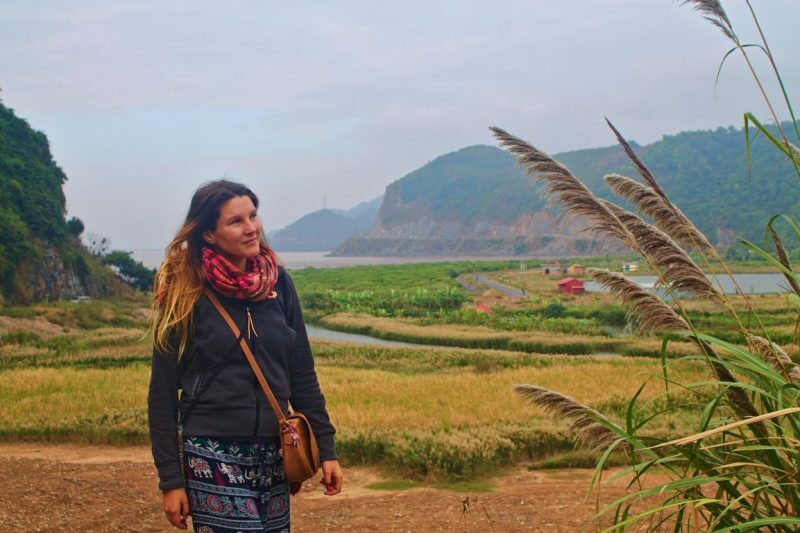 For this, we used the Vietnamese governmental website for visas, which has been completely redesigned since the last time we considered a visit to Vietnam. Still, you can only pay by credit card, which we didn’t have before we had a Czech bank account. A stamping fee of $25 has to be paid on arrival (for a 3-month single-entry visa). We heard there were no ATMs on the airport so we had to get our American dollars in advance. We were hoping to get it from the airport in Amsterdam, but apparently, $50 is too little money to get a good rate. We then ended up changing over €60 to get $50 on the Moscow airport as there was no other way to get dollars – there’s no way to get dollars in Vietnam before reaching the visa desk. A multiple-entry visa costs $50. You can find the list of prices on the visa website. Although Vietnam’s national currency is the dong, you will often see prices in US dollars. 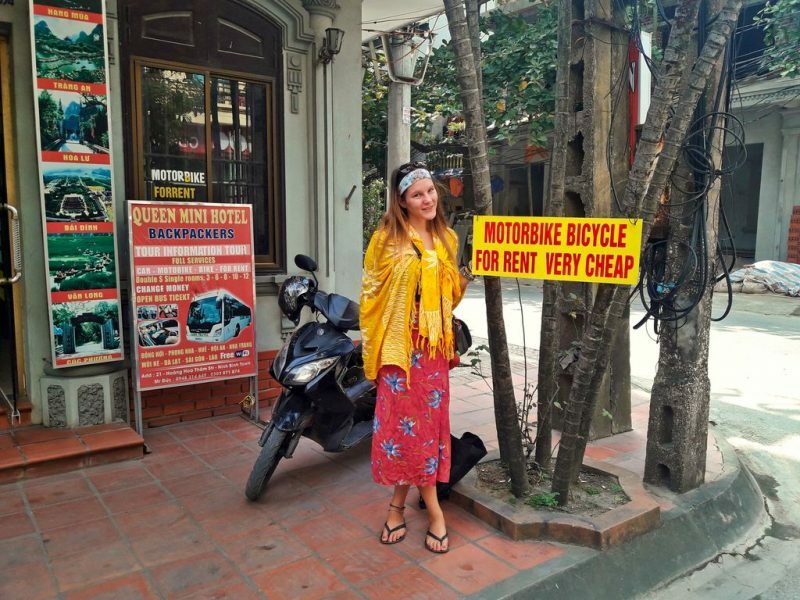 For accommodation, prices are always shown in US dollars and for some other touristy activities, such as motorbike rentals, US dollars are often used. We’re not really sure if they actually accept US dollars – because where will we get dollars from anyway? ATMs won’t give you dollars – so make sure you know the price in dongs before paying. For example, when they tell you something costs $5, this may mean a fixed price of ₫100,000. It may be the official change rate of the day, or it could be some exchange rate they just made up. Make sure you are aware of the correct exchange rate. If vendors try to sell you food or clothes mentioning only US dollars, be careful. Also look out for the word „only“. If a price tag says „only $1″, you’re likely paying more than usual. It’s very rare to come across a place where you can pay by card, so you will always need cash. Big supermarkets are rare, but they accept card payments. Hotels will sometimes have the option, but don’t rely on it. Either way, cash is preferred. Our bank charges us 9 CZK (€0.35) to use foreign ATMs. But what they don’t tell you is that the bank that owns the ATM also charges money. But don’t expect the ATM to warn you about this! Decent banks do tell you they will charge an amount, but there are some dubious banks (e.g. Maritime Bank) that only tell you „there may be a fee“. They won’t won’t tell you how much so we had to find out ourselves. Most ATMs are limited to ₫3,000,000 (€111,95) per transaction. However, sometimes ATMs indicate their max is ₫2,000,000 but this is a lie – you can still type in 3 million and it will dispense the amount. We exclusively used Agribank after we found out it’s the cheapest. We moved around quite a lot to escape bad weather. We spend another week in Nha Trang and some days in Saigon at the end of our trip because we had to wait for our flight (leaving Saigon) after we had visited all places we wanted to visit. We didn’t include this time in our budget. We arrived at Hanoi’s Nội Bài Airport. First things first: we needed money. Luckily there are several ATMs on the airport and it may be useful to know which one you should pick (read about our ATM fees one paragraph up). Most ATMs only spit out ₫500,000 notes so we just bought some water just to get some change. It can be hard to change large notes elsewhere. There are several buses leaving from the airport. There’s no need to buy a ticket first – just sit down on the bus and someone will come and sell the tickets. We took the bus to Long Biên Market (bus #86), which is right next to the touristic old town of Hanoi. The bus from the airport is more expensive than regular buses and costs ₫30,000 (€1.12) each. We were able to stay with a Couchsurfer for the first 3 nights of our stay in Hanoi. They lived far from the center so we had to take buses to go back and forth. The price of a bus ticket is always displayed on the bus and prices may vary. Our bus cost ₫7,000 (€0.29). We spent 2 nights in a hostel (Hanoi Old Quarter Backpackers Hostel) for ₫460,000 (₫115,000 per person per night, roughly 5 USD). We asked around the old town and most hostels charge 5 USD per night for a bunk bed. Private rooms in hotels and guesthouses were usually 15 USD or more which is why we stayed in bunk beds. Cheaper hotels/guesthouses were fully booked at the time, otherwise it would have been possible to get a room for around 10 USD. Hanoi was the only place in Vietnam where we had difficulty finding a place due overbooking. We also bought a SIM card while we were here. This cost us ₫215,000 (€8.02) but there are cheaper options as well. We assumed credit would already be on the card for such a price, which is normally the case in the rest of the world, but this SIM card (from Viettel) was actually unusable until we paid again to actually charge credit on it. This cost us ₫50,000 (€1.87). The cheapest credit package available was ₫20,000 (€0.75). Don’t make the same mistake as us and just get yourself a SIM card for ₫80,000 to ₫100,000 if you need one and probably it’s better to get it in a more touristic place where they actually speak some English (it’s possibly to get a tourist SIM on the airport, for example). Luckily, our SIM card was pre-registered. Otherwise, they may ask you to register the card with your personal details so the government knows what you’re up to (Viettel is owned by the Vietnamese military). Water (1.5 liter): usually ₫10,000 (€0.37), sometimes ₫8,000 (€0.30) in convenience stores. Water (1 liter): ₫7,000 (€0.26). The most common convenience store in the town center is Circle K. They sell snacks and drinks for a decent price and sometimes also noodles and coffee. It’s a good option to kill your hunger for a while until you find a good place to eat. Ky Dong Restaurant, simple but good meals for decent prices. A good place to stop when you’re on the way to the old train tracks. My Pho. Their noodle soup came without noodles and they simply forgot the rest of our order. They claim to be good and cheap, which may be true for this area. Cafe Hieu, good for breakfast. Has pancakes, toast and coffee. Xôi Vân, near Ky Dong Restaurant. Small and suited for a quick meal. Rockstore. Located right in the center and very expensive. However, on Tuesdays they offer 2-for-1 pizzas (₫128,000). Bánh Mỳ Đức Long. Good, affordable döner kebab (meat ₫30,000, vegetarian ₫20,000). Note that there is always the option to eat street food, but we generally stay away from this for several reasons: they never display their prices, it’s hard to get vegetarian food and it’s just unhygienic. Walk around the Trúc Bạch Lake and visit the Trấn Quốc Pagoda. Bring some drinks and sit by the Hoàn Kiếm Lake in the evening. Follow the railway tracks from Hanoi Station going up North, passing along houses and shops. You can find a Circle K on almost every street in the old town center for small snacks and drinks. For shopping, there is not much to find around the old town center. We already passed Intimex several times before we realized it was a supermarket. To us, the name sounds more like an underwear shop. The second supermarket within walking distance is Fivi Mart. Both supermarkets are located near the Hoàn Kiếm Lake. They still only offer a small selection, but prices are slightly better and it’s a good place to buy fruit. Find the street called Cửa Hàng Long Nguyệt. This street transforms into a night market when the roads are closed for traffic. They mostly sell clothes and the crowds make it uncomfortable to look around, but you may find some clothes there. During the day, you can visit Chợ Hôm market inside a building. Our average for Hanoi is quite low, mainly because we could save on accommodation in the first few nights and also because we didn’t eat very much. We didn’t feel like eating in overpriced tourist places and chose to eat in more local places instead or we ate cheap noodles or snacks. So, an average traveler may spend a bit more on food and accommodation but could save on getting a better SIM card. We took a train to Ninh Bình, about 100 km South of Hanoi. We booked our train online through Baolao (for booking trains online in English). We were unlucky in our booking date as the cheaper tickets cost ₫65,000 but most seats were sold out, leaving only ₫90,000 tickets for us. At the end of the booking, they charge a ₫40,000 service fee and on top of this, a processing fee of ₫15,000. A local approached us and asked us if we needed a room for the night while we came from the station. We still had some walking ahead of us and it was already late so we accepted. It was a very luxurious hotel room for ₫230,000 ($10 / €8.58). We could leave our luggage behind and we borrowed bicycles for free from the hotel to check around town for a cheaper room. This is how we ended up in the „backpacker area“ of Ninh Bình. The hostels here were surprisingly expensive when it comes to private rooms, but we found a nice hotel room for ₫130,000 (€4.85) per night. We got a decent price because we booked for 5 nights. Dorm rooms are cheap at only ₫100,000 (€3.73) per person. There is nothing to see in Ninh Bình itself. To explore the area (Tam Coc), you need a motorbike. You can rent motorbikes practically everywhere for ₫100,000 (€3.73) but the Queen Mini Hotel charges only ₫90,000 (€3.36) so we got ourselves a motorbike from there for 3 days. Motorbikes always come with a minimal amount of fuel. We paid ₫70,000 (€2.61) for a full tank. We stayed in Ninh Bình for convenience: the train doesn’t go as far as Tam Coc and it’s too far to walk Ninh Bình. If you do plan to stay in Tam Coc, you can take a bus from Hanoi directly there. This will be cheaper than the train (approx. ₫80,000 (€2.99)). In at least one restaurant in the „backpacker area“, you get free beers and snacks when ordering food. Cheap convenience shops such as Circle K that are abundant in Hanoi, are not found here so it can be harder to find what you need. The area is generally cheap, but when it comes to entrance fees, it can get pricey. Although we didn’t really plan to go to Hang Múa, we accidentally ended up there and had to pay ₫10,000 for parking. To actually get inside, you have to pay ₫100,000 entrance, which is expensive considering it’s only a hike up a mountain. We decided to go in anyway. The views are nice but unfortunately, we didn’t have the best weather for it. We bought a water and a coke outside, each ₫15,000. If you plan to come here, it’s best to bring your own water. Our spendings for Ninh Bình are higher than in Hanoi because we rented a motorbike and we visited Hang Múa. If you decide to visit more sites (e.g. the Bích Động Pagoda, the ancient capital of Hoa Lư or the Bái Đính temple), be prepared for high entrance prices (at least ₫100,000 plus parking). However, there is already plenty to see if you drive around in the area. Also, the expensive train ride is calculated in the price. 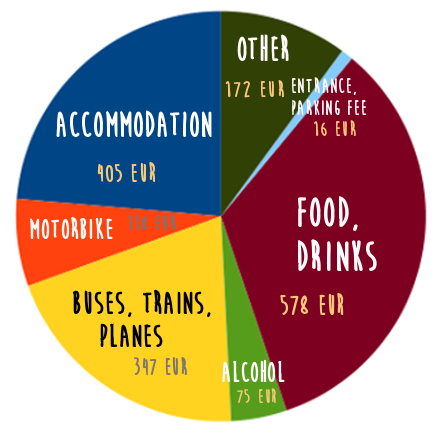 If we leave out the train tickets, our average spendings come down to €8.95 per person per day. In the backpacker area, meals often come with free beer, which reduced our spendings on food and drinks a little. On first sight, Huế didn’t look like the backpacker destination that we were expecting. Instead, it seems more like a regular holiday destination for rich Australian and British tourists. This means prices in Huế are higher in the tourist area but good prices can still be found when you take your time to look around. Most accommodation in Huế is located in the town center, which was a long walk from the train station we arrived at. We only looked at Google Maps to find locations of hotels/guesthouses/hostels but the first place we found accidentally. It’s called Khách Sạn Bình Dương. The room cost $9 and was the most luxurious we’ve had so far. They also had $8 rooms but they were unavailable at the time. We initially booked 1 night but extended later on. We also rented a motorbike from Bình Dương for the first day. Their price list indicated a motorbike costs ₫100,000 but they tried to rent it out for ₫130,000 „because it’s an automatic“ (so far every motorbike we rented was an automatic) but we did get our way and paid ₫100,000. The motorbike was very old; the lights didn’t work, the brakes weren’t great and it felt as if the whole thing could fall apart when driving it. After we explored the touristic center a little, we decided to extend our stay in Khách Sạn Bình Dương. We found hostels in the center charge $10 per night for a private room but the rooms are nowhere near the luxury we had in our guesthouse. Dorm rooms are the same price as elsewhere: $5. Motorbikes can be rented practically everywhere (hotels, hostels, booking agencies, etc.) for ₫100,000. We had our first meal in the Stop and Eat, a restaurant near the center. We spent ₫55,000 on a plate of spring rolls, ₫55,000 for a plate of rice with vegetables, ₫25,000 for an iced coffee and ₫15,000 for a regular coffee. The meals are slightly more expensive than we experienced so far, but the food was very good. In the evening hours, part of the center is closed down for traffic and turned into a walking zone. This is when all the tourists come out to walk around. Often you will find decent prices only to find out that they actually cheat you on the portion size. We had a plate of rice with veggies (₫35,000) and a plate of rice with chicken (₫45,000) – regular prices, but the portions were laughable and we had to go and grabs some snacks elsewhere afterwards. It’s good to know that there is a big supermarket in Huế called Coop. They have things like bread and cheese that you won’t find elsewhere and prices are lower than elsewhere as well. One sign that Huế attracts a different kind of tourist is that pushy people keep coming up to ask if you need a ride, a tour, or drugs. To get a ride around town, you can pay ₫100,000 to get on a „cyclo“, a seat in front of a bicycle with driver. The price is the same price as a motorbike for a full day so it’s generally used by richer elderly tourists. Also, people on motorbikes will ask if you want a ride on the back, no matter how much luggage you are dragging around. When you say no, they’ll try to flog drugs instead. For the Camel bus company the price is ₫380,000 to ₫400,000, depending on where you book (hostel Amy was the cheaper one). For Hung Thanh bus company the price is lower: ₫260,000. We have only read negative things about these bus companies and decided to book a train instead. A train with hard seats costs ₫175,000 so it’s much cheaper than any alternative. However, when we saw what these hard seats look like, we decided to travel in luxury and we booked the soft seats for ₫399,000 each (excluding booking fees). Huế is a popular destination for higher-end tourism which has driven up prices. Due to small portions you’ll end up eating more and spending more. Even though we stayed in a luxury hotel, we couldn’t find a better price in other places we asked around. 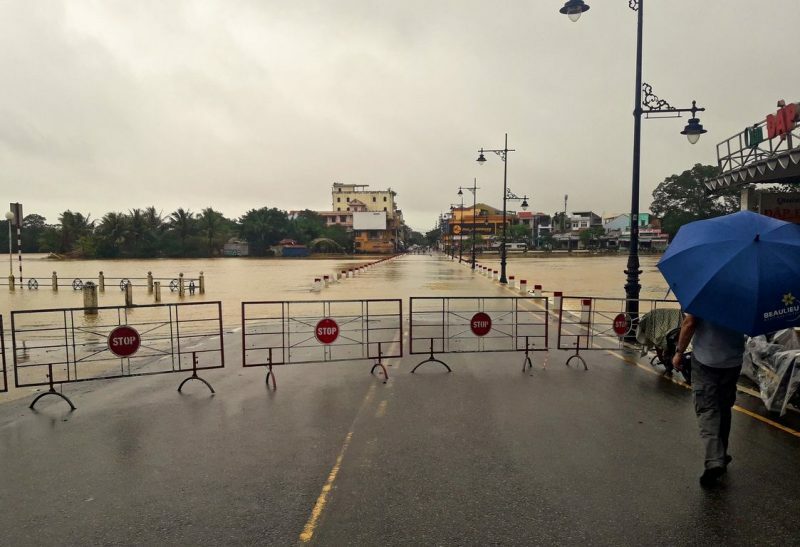 Due to the extreme rain and floods in Huế, we didn’t have the chance to see much of the area and we didn’t take a motorbike after the first day as most roads were flooded. In the end, Huế was a bit disappointing for us. It turned out, choosing the train over the bus was a mistake. The train got stuck due to landslides, causing hours of delay. While we discussed our options, since we could ask for a refund, we were called over. The train just arrived – 3 hours late. We didn’t drive far though: the rain got stuck again and we had to wait for buses to arrive to bring us to Đà Nẵng. From there we got on another train. This delayed our journey again by a few more hours. With only limited food supplies, we ended up buying some food and drinks on the train. 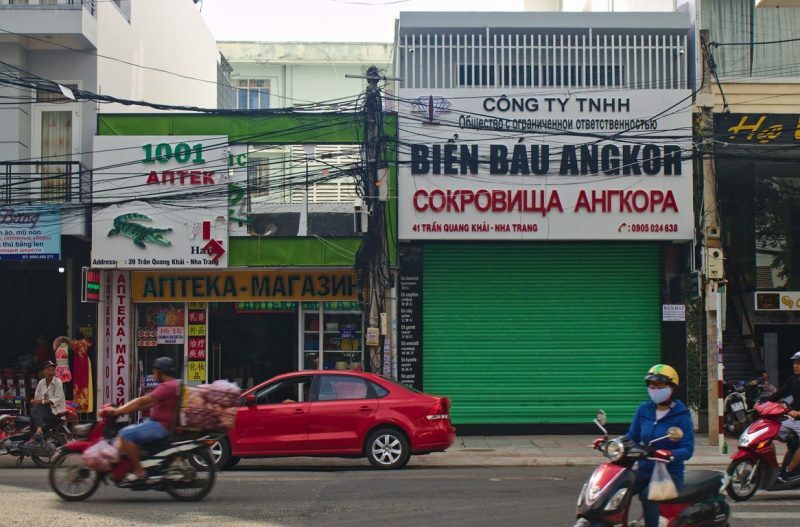 When we arrived in Nha Trang, we felt like we ended up in Russia. The roads and buildings looked more modern than usual. 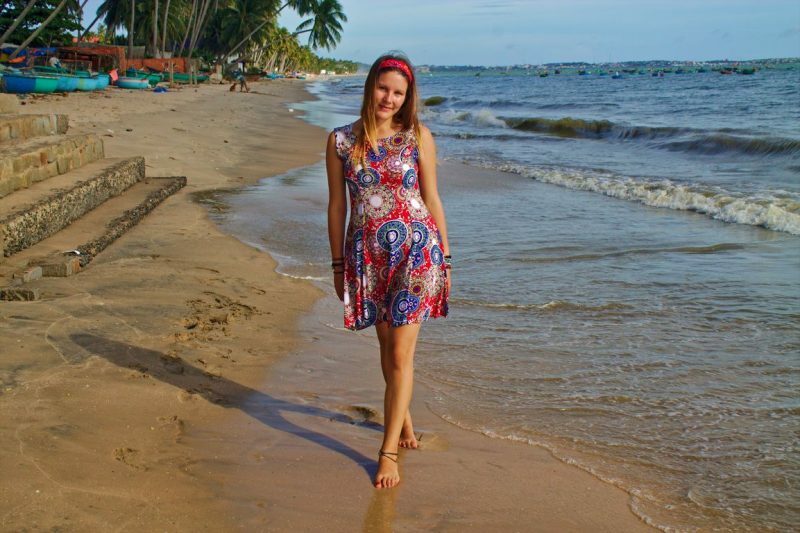 Closer to the beach, you will only find high-rise buildings and many expensive hotels. Not only that: suddenly all signs were in Russian. People acted very rude and even spoke Russian to us (do we even look Russian?). 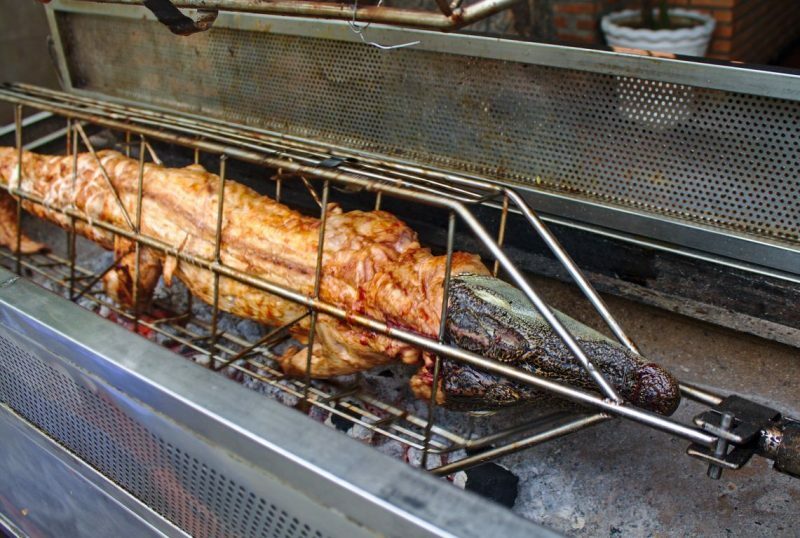 It’s obivous Nha Trang caters to rich Russians: restaurant prices are generally much higher, service is Russian style too: no longer friendly smiles, only grumpy faces. It took us a while to find the right places – they are mostly hidden away in the side streets. If you’re one of the people that like to spend more money on restaurants because of the atmosphere or whatever, be prepared to get very small portions. Our first day started with great weather. We rented a motorbike to explore but it started to rain again so we didn’t rent it for more than one day. The rental price was ₫80,000 (€2.99) – the best price we got so far – but elsewhere we overheard a Russian couple paying ₫200,000 (€7,46) after admitting they were staying in the exclusive hotel across the road. We didn’t have the chance to ask around for accommodation during the first night because most hotels we found were still closed. We decided to sit out the first night by the beach. We then got a room for $7 (₫160,000) in Queen 7 Hotel and stayed there for 3 nights. Possibly it’s the size of the tourism industry in Nha Trang that causes prices to go down due to competition. We paid less for our motorbike and accommodation than in other places so far. Food, however, is harder to get for a good price and we did spend too much when we didn’t know the right places to go yet. 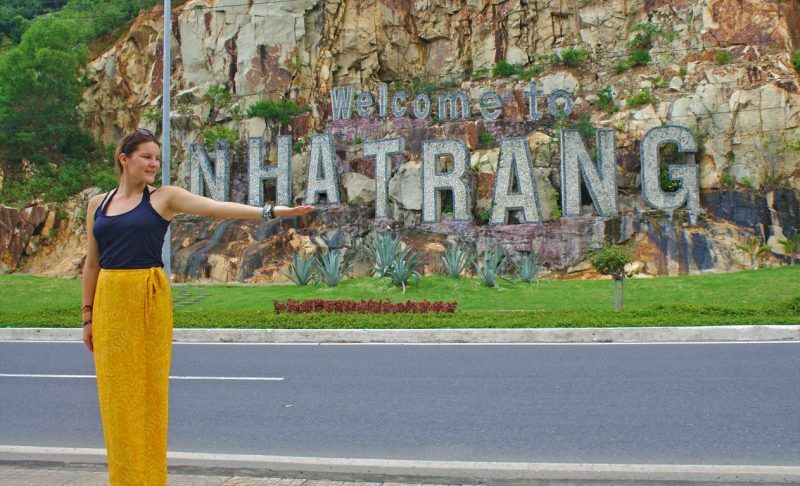 There is not much to do around Nha Trang. People come here mostly to hang out at the beach. We were planning on visiting the empty beaches a bit further from the city (Bãi Dài Nha Trang, on the way to Nha Trang’s airport) but this is no longer possible. The whole beach has been turned into a construction site. Very soon you can only enjoy the nice parts of the beach if you are willing to pay for a resort. We escaped the floods of Huế only to be rained upon more and more in Nha Trang. Finally, we found a place where it doesn’t rain. This was Dalat’s biggest advantage. However, it does get windy and very cold, especially around sunset. Our bus from Nha Trang to Dalat cost us ₫130,000 (€4.85) per person. 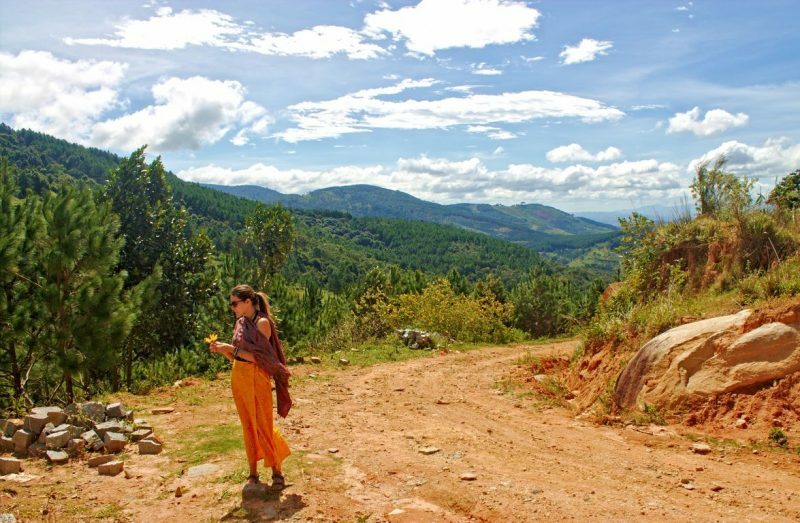 The downsides to Dalat are: lack of food, prices are higher and, although the surroundings are nice, there isn’t that much to see in the town itself. The problem with food is that it was hard for us to find places to eat. It seems all restaurants are hidden. There is some street food, a popular one is their version of a pizza (₫20,000), but that’s a bit hard to survive on. We mostly ate our breakfast in a bakery near our hostel. It’s surprising to see they have an actual bakery with some good buns – most „bakeries“ are actually cake shops. As for prices, we paid a lot more for our accommodation. While asking around, all hotels near the bus station asked for $12. Hostel dorm rooms are the regular price of $5. We eventually settled for a private room for $10 in Dalat Central Hostel. At the same place, we rented a motorbike for 1 day for ₫100,000. However, we had to haggle to get these prices because they were asking for more initially. There is a big shopping center in Dalat with a large supermarket. The supermarket is called Big C. The food selection is still small, but you’ll save some bucks by getting your basics here. 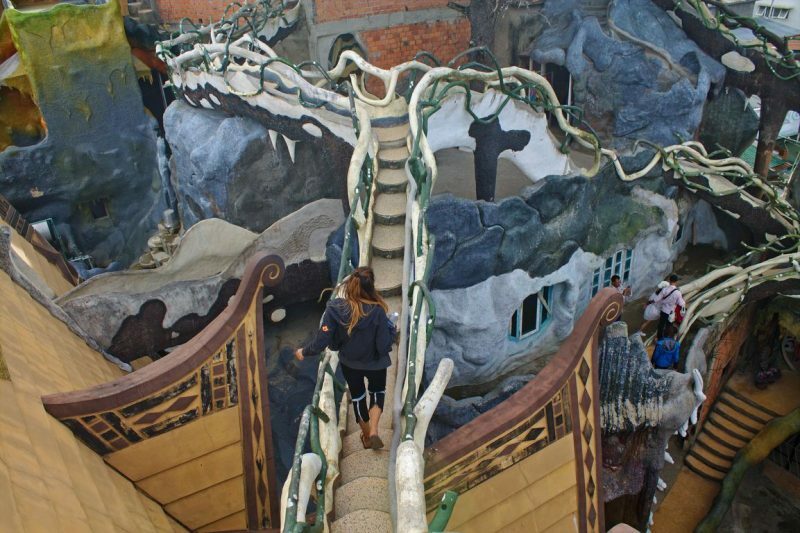 We paid ₫50,000 per person for entrance to Crazy House. The Crazy House was interesting but the large groups of Russians with loudspeakers are an annoyance. When the crowds dissipate a bit, it’s more fun to walk around. There is a café and there are some shops inside and outside, but all are very much overpriced. We’re not sure if there is a parking fee as the Crazy House was close enough to walk to. There is a little shop and a restaurant inside. Both don’t display prices, a sign that prices may be higher than normal. We bought a coke for ₫15,000 (normal price is ₫7,000) and decided not to eat here. Dalat has a supermarket which can bring costs down but there are not a lot of places to eat in Dalat. All interesting places to sightsee charge entrance fees. We spent slightly more on beer because we spent an evening in a bar, where beer is more expensive (₫20,000 big bottle light beer, ₫25,000 small bottle regular beer). For the first time during our trip, we decided to make an online booking through Booking.com because they offered a discount on a room, to be paid in cash. The price was $7 but when we arrived, we extended our stay with 4 more nights and got a better price. We rented a motorbike for the standard price: ₫100,000. We got the motorbike from our place. We drove to the gas stations to fill up but in case you run out, you will be able to buy fuel (for a higher price) from shops with little pumps all along the road since the gas stations are a bit far away. We got to Mũi Né by bus from Dalat for ₫100,000 per person, booked from our hostel in Dalat. Mũi Né is the best place to eat. There are restaurants all along the coast and the prices are very decent so we were not that hungry here. The first time we made a short stop at a nearly empty beach, we found out the beach is not safe. Not only because of jellyfish, boards with nails sticking out and used needles, but criminals make their rounds. Someone managed to open our motorbike’s seat without a key and stole our camera. This was the only time we left something valuable in there because we only went for a quick look and were only a few meters away from our motorbike. From then on, we never left anything inside but we noticed several times when coming back to our motorbike that the seat had been opened again, even after making sure it was really closed when we left it. This wouldn’t be our first encounter with criminals in Mũi Né as the very same day we were stopped by the local uniformed crime syndicate: the Mũi Né police. We read about the corrupt police of Mũi Né who try to extort foreigners just for driving without proper papers. This information was a few years old and we didn’t expect this would still be going on. Afterall, there are many tourists here who all need transportation. We did get pulled over. For some reason, my international driver’s licence doesn’t include Vietnam in the list of valid countries. Also, it’s expired years ago and even if it were valid, it still doesn’t allow me to drive a motorbike. But the only thing the policemen were interested in, was my picture that was a bit more recent than my 10-year old picture on my regular licence. They decided it was all good and they let us go. It’s not the first time my expired licence got me out of having to bribe the police, so it’s always good to keep old papers and perhaps it also helps to not be Russian. Like Nha Trang, Mũi Né is full of Russian tourists who generally don’t know that it’s not common to drive drunk without helmet outside of Russia. We booked our stay at Garden Guesthouse, which was very hard to find. Many places don’t show on Google Maps and our guesthouse didn’t even have any signs posted outside. It was an 8 km walk from where the bus dropped us off. This is another annoyance because nobody ever seems to know where the bus will exactly take you. As it’s not normal in Vietnam to walk, the whole way we were shouted at by taxi drivers, motorbike drivers and drug dealers. The more West you go from Mũi Né, the more Cyrillic signs and liquor shops you will see. Here are the expensive Russian resorts and, obviously, the food (and everything else) will be more expensive. We did end up buying a bottle of rhum (₫50,000) but this simple mix of water, ethanol and some aromas was barely drinkable – but we didn’t go blind. Since Mũi Né is a fishing village, there is plenty of seafood to find here as well, a bit more expensive than the regular meals. Also, if you ever want to try more exotic foods: they have snail, frog and crocodile on the menu (noodles with crocodile meat: ₫100,000). Luckily, most of the sights are for free to see: the beaches, the white sand dunes, the red sand dunes. We didn’t visit the Fairy Springs, which was close to our place, because of what we could see from the road: it looks like a dirty stream and we’ve seen better elsewhere for free. The entrance would have been ₫10,000. 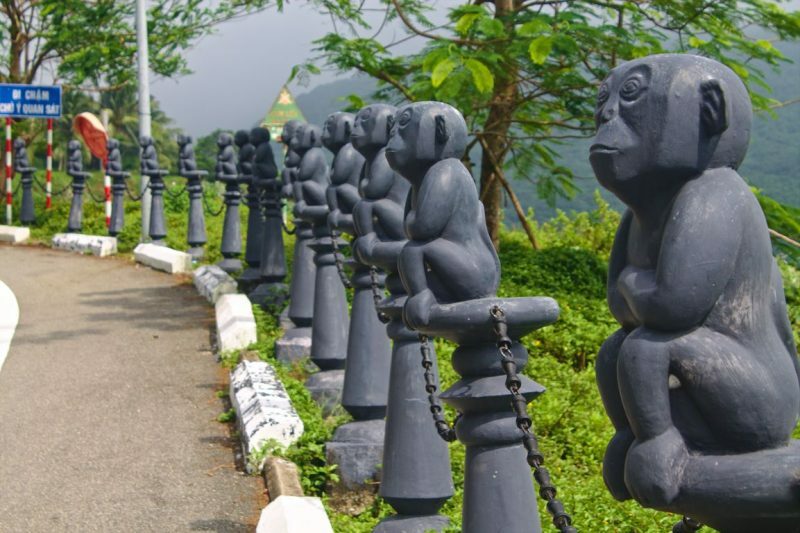 For more ideas, have a look at guide to Mũi Né: 10 unusual things in Mũi Né nobody told you about. From Mũi Né we booked a bus to Saigon for ₫130,000 each. We had already booked a flight to Phú Quoc from Saigon so we wanted to be here in time. We looked online to find some affordable places but we didn’t book anything because we didn’t know where the bus would exactly take us. The bus had a 4-hour delay so it was already dark when we arrived. We noticed the high-rise buildings and the modern look of the city, combined with the trashy streets full of rats and mice. We started looking around for guesthouses and hotels. This is when we found out Saigon is considerably more expensive than the rest of the country. 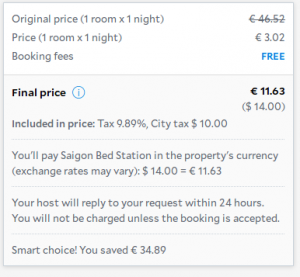 All guesthouses and hotels charged around $14 for a private room – nearly double the regular rate in Vietnam. Not only that, it seemed nearly impossible to find an affordable place to eat: prices were comparable to European price. For example: a simple phở soup will cost around ₫25,000 on the street to ₫35,000 in a restaurant; but here, the first price we saw was ₫50,000 but we saw prices up to ₫90,000 for a simple phở. Most hostels are located in one small part of town. We headed there. Suddenly, we ended up in an overcrowded street full of foreigners. All sound, music and karaoke was extremely loud. Prostitutes everywhere and people constantly asking us if we need massages or drugs. We found a hostel and took one night for $6 each because we were tired of looking around. We left our luggage and walked around the corner, only to find there was another hostel: Hotel Mobylette. Really nice rooms, beds and bathrooms, no loud noise and a roof terrace. Not only was this hostel much better, it was also cheaper: $4.90. A discount rate because the hostel just opened a week ago – so prices may still change in the near future. The only downside to this hostel that is used to be a brothel so men and women sleep separately to prevent horny perverts from still coming here. In Saigon, there are many small convenience stores, such as Circle K, just as in Hanoi. Go here for better prices but the shops are generally smaller and offer less food choices than what we’ve seen in Hanoi. 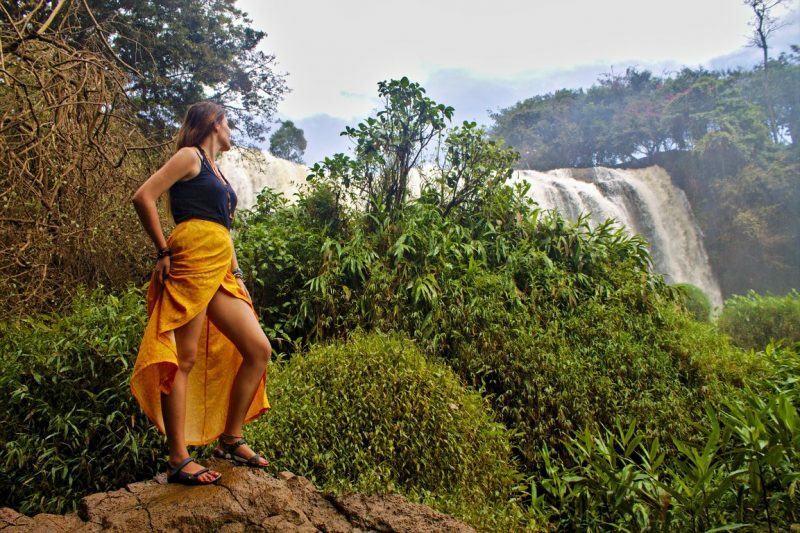 Phú Quốc is practically a different country compared to Vietnam, especially when you compare prices – our budget ended up being ₫700,000 (€26.16) per person. 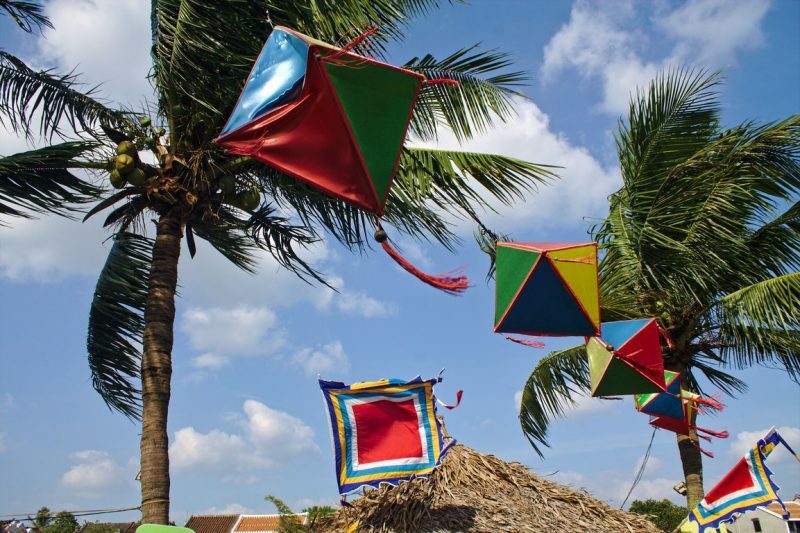 For that reason, we created a seperate article with our budget for Phú Quốc. We initially skipped Central Vietnam due the heavy rains and floods in the area. We were still hoping to come back later. We had already booked our return flights to Saigon from Phú Quốc and since we decided to try Đà Nẵng again, we booked a flight from Saigon to Đà Nẵng for a total of ₫1,339,800 (€50). If you come from Huế, it’s not far, so getting a cheap bus or train should be no problem. We arrived in the third week of December and the weather started out pretty good, but this didn’t last very long. One reason we stayed this long is because we were waiting for the weather to get better. We booked long enough to stay in Đà Nẵng during Christmas, leaving just in time to escape the next tropical storm coming this way. The weather wasn’t going to get better any time soon. We stayed in Mint Guesthouse. We booked in advance because our plane arrived just before midnight. We booked a Grab driver to bring us there (approx. 5 km) which cost us ₫84,000. This includes the airport toll of ₫10,000. Our stay in Mint Guesthouse was reasonably priced and came with free breakfast. Not having to search for a place to eat every morning saved us a lot of time and money. We took a longer break this time and stayed nearly 2 weeks in Đà Nẵng. We did look and ask around for another place to stay but we didn’t find a place under $10 that was better than our guesthouse. The small town of Hội An is not far from Đà Nẵng. It’s surely too far to walk, but by motorbike you’ll be there in 30 minutes to an hour. We visted Hội An a few times during our stay in Đà Nẵng. If you’d like to stay the night in Hội An, you may want to take a bus there. When we drove around, bus stops had big signs saying buses to Đà Nẵng are for free. Although Hội An is a nice little town, it’s also overcrowded with tourists and therefore more pricey and full of pushy salespeople. This is why we decided to stay in Đà Nẵng, only to visit Hội An during the day. A Hội An local dish called cao lầu is very popular here and we also tried a plate. As always: stay away from the tourist main area and prices aren’t too bad. We spent a total of ₫97,000 on two meals and drinks at Vi Cafe. The cao lầu cost ₫30,000. Apart from local food, Hội An is famous for its clothing stores and leather products. This is the place to go if you want to get your clothes tailored or if you need a new bag. Tina did need new bags. In the more touristy part, there was no way to haggle ₫1,400,000 (€52,24) down to a decent price. A bit further though, a similar bag cost ₫350,000 (€13,06). We were interested in a Vietnamese coffee maker. Here it costs ₫90,000 on the market – we later bought one in a supermarket for ₫23,000 instead. Make sure you look around before buying anything in Hội An. The best time to visit Hội An is after sunset. Old ladies sell overprices candles floating in paper lanterns for tourists to litter the river with. Lanterns on boats along with floating candles light up the river at night, colorful lanterns light up the houses in town. Monkey Pass is simply a small, bendy road going through the mountains. 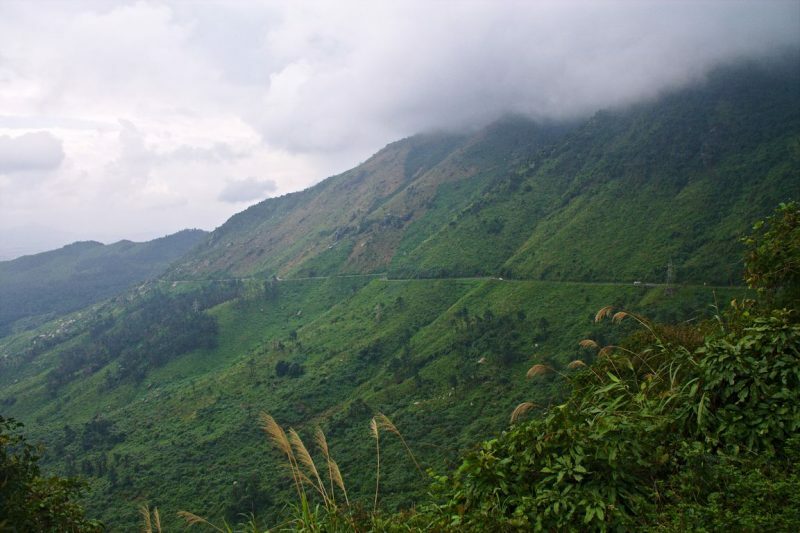 For us – and most others – these hills were too steep to get up when carrying a passenger on the motorbike. That’s why we didn’t make it all the way and turned back halfway. There is a chance you’ll see monkeys. We only saw them once we came back down the mountain. On the way to Monkey Pass, you’ll have a view over some abandoned beaches – abandoned because they are hard to reach – and the beautiful Linh Ứng Pagoda. Both entrance and parking is for free if you drive up to the top. If you stop halfway to see the giant Quan buddha statue, it appears you have to pay to park there but we skipped this part. A bit over 30 km from our place, we visited the Hải Vân viewpoint on a rainy day. The pass itself is a nice drive: light traffic, great views over beaches, the ocean and Đà Nẵng on the horizon. If you come from Huế, the bus will take you along this road as well but of course it’s better to enjoy it yourself by motorbike. You’ll have plenty of opportunities to stop along the road to enjoy the views. Then, on the top of the mountain, you’ll find some ruins which make a great viewpoint. Busloads of Asian tourists stop here to pose for pictures. Vincom Plaza with a large Vinmart inside. The Big C supermarket, right across the road from Con Market. Lotte supermarket, next to the (seemingly abandoned) Asia Park. Free parking in the first hour. Han Market, the place to go if you need new clothes. Con Market. Very small, tight and crowded. A great place to go if you enjoy being pushed around and getting hit in the face while looking for clothes. Unless if you are okay with eating at roadside stalls with local food without menus, it can be hard to find the right place to eat. Therefore, we spend a lot of time driving around looking for the right places to go. Luckily, our guesthouse had a free breakfast included which saved us a lot of time and money. We tried our first meal at a vegetarian place recommended online: Ngọc Chi Vegetarians. Prices were very good (around ₫30,000 for a meal) and we can definitely recommend this restaurant if you like your meat to be replaced with a lot of mint leaves and tasteless tofu. It’s not our thing though. If you look around, you’ll notice a lot of overpriced restaurants. Even where you may not expect prices to be that high. One of the best restaurants we initially found, was Pizza Base. Although they mostly serve pasta (₫30,000–₫40,000) and pizza (₫79,000), they are cheaper than any other place we found nearby. We thought it was strange that a restaurant with Western food is cheaper than the little Vietnamese restaurants in the area. Still, the quality was surprisingly good too and we can definately recommend their coffee-chocolate milk shake and fruit shakes (₫25,000). We ended up eating here nearly every day. The area we were staying in was called Bắc Mỹ Phú. Closer to the beach, there are many more tourist accommodations and restaurants, mostly very overpriced. We found one exception, an expensive-looking hotel that offered beer for a decent ₫8,000. We got ourselves two beers, a small pizza and a coffee, for ₫85,000 in total. The rest of the food was much too expensive. Our pizza came with small pieces of plastic inside, nearly breaking my teeth. The beer came in a small cup and tasted like water. The coffee came with fake Vietnamese milk even though we asked for a black coffee. We almost considered getting a cocktail (around ₫50,000) but got out of here as soon as we finished our pizza. As always, the more expensive the place is, the less we get for it. We did stay in Bắc Mỹ Phú for Christmas, expecting some kind of celebrations. Only one hostel organized an open event, but there was very little interest. Most guests were digital nomads who only had interest in their own laptops and seemed mostly annoyed by the free movie night. We too didn’t stay long and had some drinks elsewhere. We spent a lot of money buying new clothes and bags, but this gets evened out in the average costs because we stayed in Đà Nẵng for so long. We only spent the first week exploring. After that, we had a little break and therefore, spending less, until our Christmas celebration. After nearly 2 weeks, we really wanted to get out of Đà Nẵng. It was mostly raining here and a typhoon was expected to hit the South so we went back to the North and took a plane to Hanoi where we stayed for a week so we could stay here for New Year’s Eve. We booked accommodation in advance for the whole week because we expected that finding a room on New Years Eve would be difficult. Indeed, many places were fully booked already. We wanted to find another place with free breakfast included as this saves a lot of time and effort. Also, we wanted to be in the center. We got a private room in Blue Hostel for ₫270,000 per night. We took a plane to Hanoi and used Jetstar this time. Their tactics of adding more and more fees in every step of the booking process are similar to Vietjet’s, so our tickets were significantly more expensive than advertized. We had some luck though. Some people stole our seats and pretended to be stupid so they didn’t move. We were forced to sit in the only available seats: the more expensive seats with leg space. This made our flight a lot more comfortable. Hanoi, like Saigon, is less hygienic and more expensive. You can either dish out high tourist prices in the old town center or you can find a more local place. Since we didn’t want to go for extremely high-priced places, we got some health issues and had to extend our stay with another night. Unfortunately, both New Year’s Eve was barely celebrated here (only by some tourists) and the weather was no better than in Đà Nẵng. We found some better places to buy and eat this time, such as supermarkets that we didn’t know about before. We have already included them in the first Hanoi paragraph. We will only mention our total spendings of this visit. We took an overpriced flight and spend our New Year’s Eve in more expensive places in the town center. This increased our spendings. On the other hand, we ate very little and mostly survived on chips, cookies and bakpau and our free breakfast. By now, it was raining in the South and going more North would mean even lower temperatures. We were very much done with Hanoi. 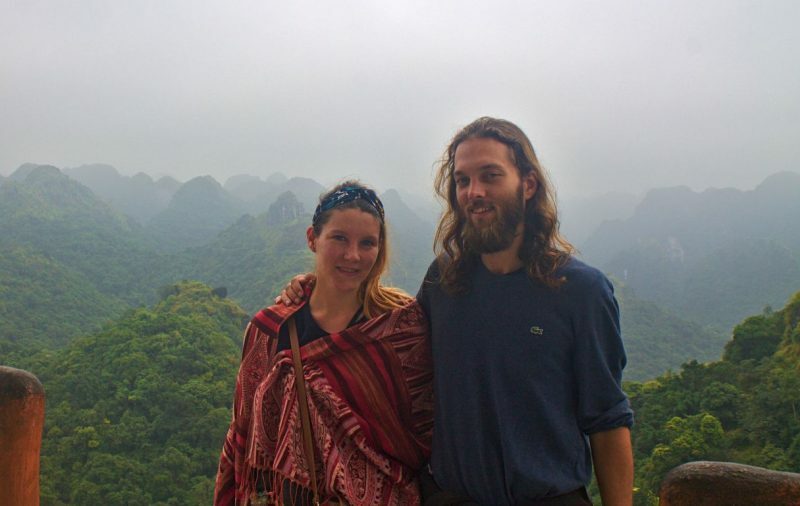 There was not much choice for us left and we decided to visit Cát Bà island. It was a relief. No more fog or rain and after a week in Hanoi, we could really feel how different it was to breath in fresh air. We booked a bus to Cát Bà from our hotel in Hanoi for ₫270,000 each. The bus took the ferry over to the island and dropped all passengers off at their accommodation. We have no complaints about the bus company (Daiichi) but booking a return ticket from our hotel on Cát Bà would cost us only ₫130,000 each. Since a couple of months, there is a new ferry crossing to the island that only takes 10 to 20 minutes. Cát Bà is actually a very quiet place. Most people only come here to take one of the Hạ Long Bay tours and don’t stay long. It has a more „backpackery“ feel, like Ninh Bình and Tam Coc, and the prices reflect that. 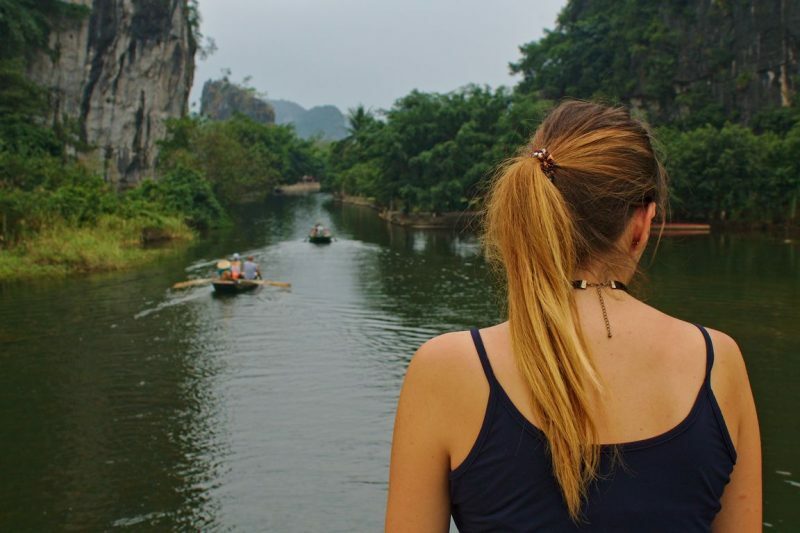 A day tour on Hạ Long Bay (with kayaking, lunch and a visit to Monkey Island) costs $10, but there several other companies offering tours so you can also find more expensive tours that may or may not include more. 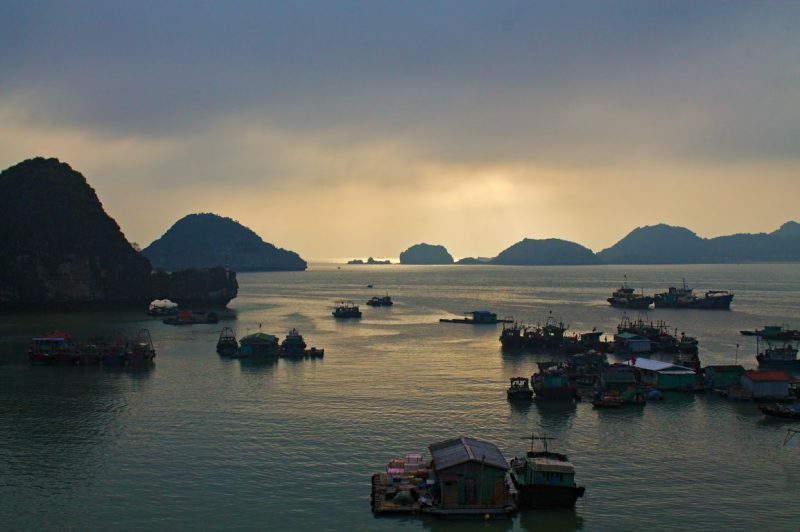 Sunset view of Hạ Long Bay from Le Pont Hostel in Cát Bà Island. This was one rare moment where the fog and rain cleared enough to see some sunlight. The price for renting a motorbike for one day is only ₫70,000, the cheapest place we’ve found in Vietnam. The owner told us ₫50,000 in fuel would be enough to tour the island. He was right. We drove all the way North, to where the ferry departs to Hạ Long city. We visited the Cát Bà National Park (₫40,000 entrance) and drove back along the coast, stopping for some nice views. We got back early and still had half a tank of petrol left. We drove the steep hill up to Cannon Fort and decided that paying entrance (₫40,000) for this wasn’t worth it. Despite being quite a sleepy town, it’s very noisy everywhere. The reason: construction. Not unique to Cát Bà, construction is going on all over the country, excessively so in touristic areas. It’s obvious that there is not much time left before this island also will be taken over by upscale resorts and hotels. The beach nearst to town is Cát Cò 1 Beach. It’s nice and clean, but there is construction going on all around. The town itself is very small and you can walk everywhere. 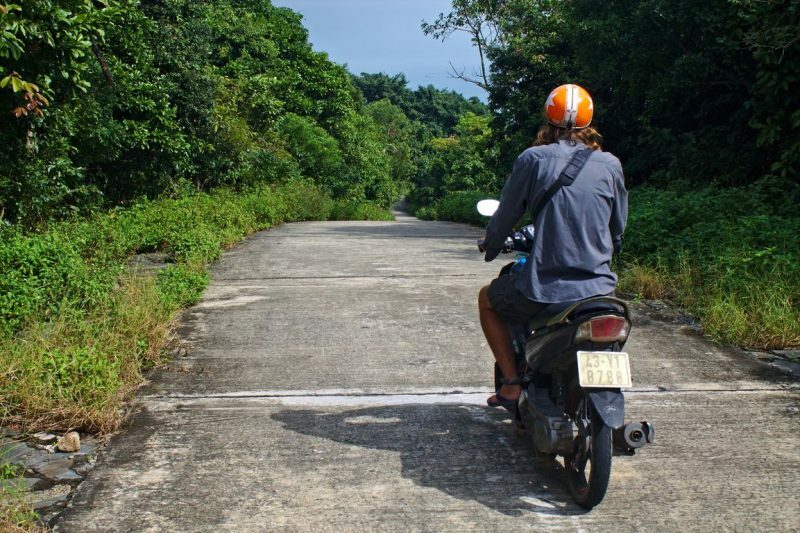 To explore the rest of the island, you’ll need a motorbike. It won’t take more than a few hours to see the whole island. 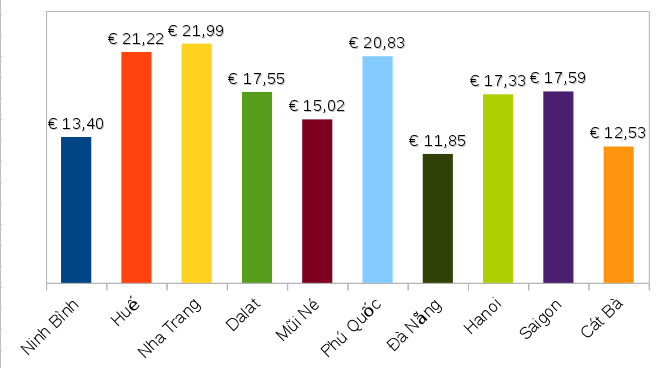 Cát Bà is the cheapest place to rent motorbikes; it costs $3 or ₫70,000 (€2,61). We booked a bus from our hotel in Hanoi to get to Cát Bà. We paid ₫540,000 to get here (₫270,000 per person), which includes the ferry. We thought the price was a bit steep but took it anyway. We took the same bus back Hanoi which cost exactly half: ₫270,000 for both of us. You can still find decent places to eat. The expensive places can be found along the waterside, the better and cheaper places are not far away. Most places offer happy hours, such as Dolphin restaurant where you’ll get free beer, sake or tea with your meal. The local beer comes from the nearby Hải Phòng and generally costs only ₫10,000. We did eat along the waterside and paid a bit more for our food, but our drinks came for free (tea and „happy water“). Le Pont Bungalow Hostel: not the cheapest but a great, quiet place to have drinks with a view over the bay. A popular tourist activity in Cát Bà is inhaling nitrous oxide from balloons. We also gave it a try but it was just a waste of money and had no effect (price: ₫30,000 but for free during happy hours). Beer and cocktails are cheap during happy hours: ₫10,000 for a beer and cocktails are half price (around ₫50,000). Visit the national park. The route starts next to a building with „specimen rooms“ where stuffed animals are shown on display. Their skin falls off at times and the glass to look through is yellow. You can skip this part. Next, you’ll pass the „temporary“ rescue cages with some stressed-out monkeys locked up in there. The cages look sad and dirty. The monkeys are very bored and may appreciate a snack. We brought them some nuts we found on the way. Then the trail begins. It’s a long hiking path going up where you will have to do some climbing. Note that people don’t stop littering just because it’s a national park. There is a viewpoint on one mountain, after a tough climb. The path then continues to another viewpoint on a higher mountain. We didn’t go all the way to the end. Presumably the view is amazing but sadly, we mostly saw fog. The country and its people made a good overall impression on us. Traveling is also safe there. If you’re looking for a balance between city life and nature get-aways, Vietnam won’t disappoint. 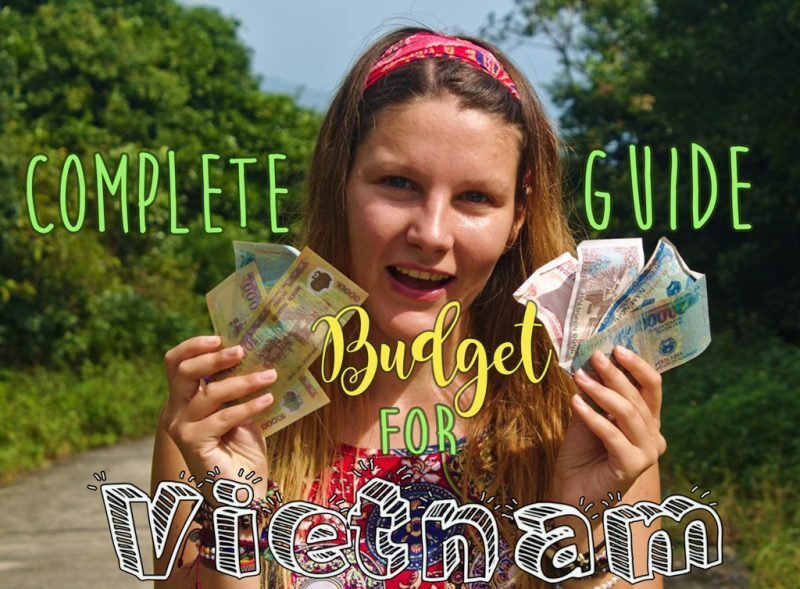 Although it’s still possible to travel Vietnam on a budget, it’s already slightly more expensive than its surrounding countries that we visited. We’ve noticed less backpackers than we expected. Instead, the more touristic places are full of families, rich pensioners and Australians – the people who generally have more to spend and are happy to tell locals to their face how cheap everything still is for them. The type of tourists and the massive amount of construction going on everywhere, combined with Vietnam being one of the world’s fastest growing economies could mean prices are about to rise in the next years. We spent a lot of money taking trains and flights back and forth. If our trip would have been planned out a bit better, we would have saved a lot of money on transportation. The most expensive places to go are the cities (especially Saigon) and Phú Quốc island. Most of our budget went to eating in restaurants. We never ate street food. How does €13.65 (i.e. US$17) a day compare to other Asian countries? 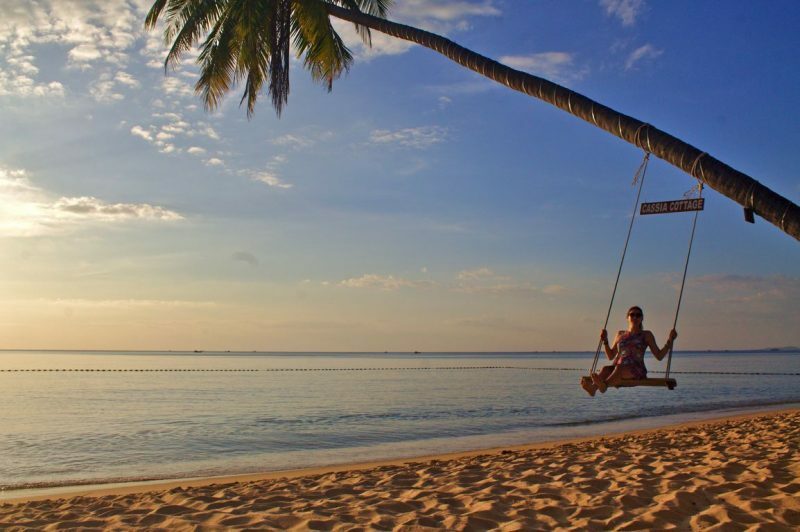 Read our budget guides on Bali (Indonesia), Cambodia and Siquijor (the Philippines). I loved your blog. I was looking for info in different blogs but was disappointed when those budgets surpassed 40 dollars in a day. Do you guys think its worth to buy a buss pass for a month? 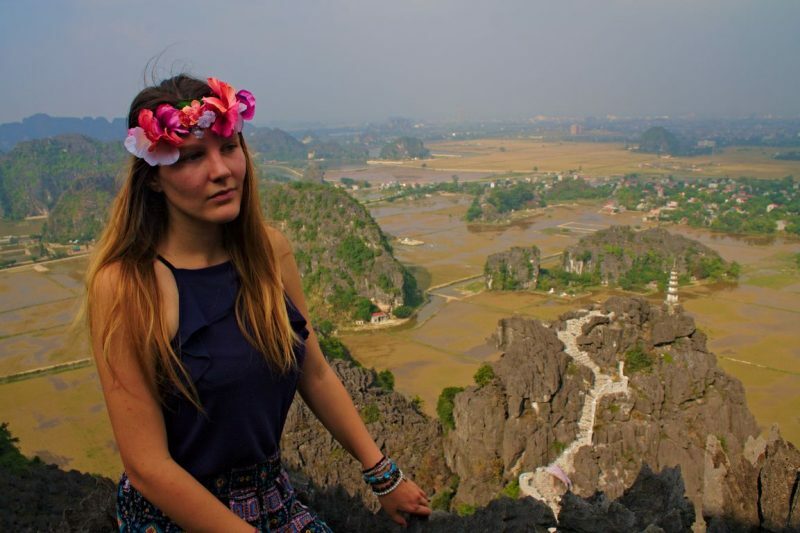 Any particular reason you skipped Phong Nha? 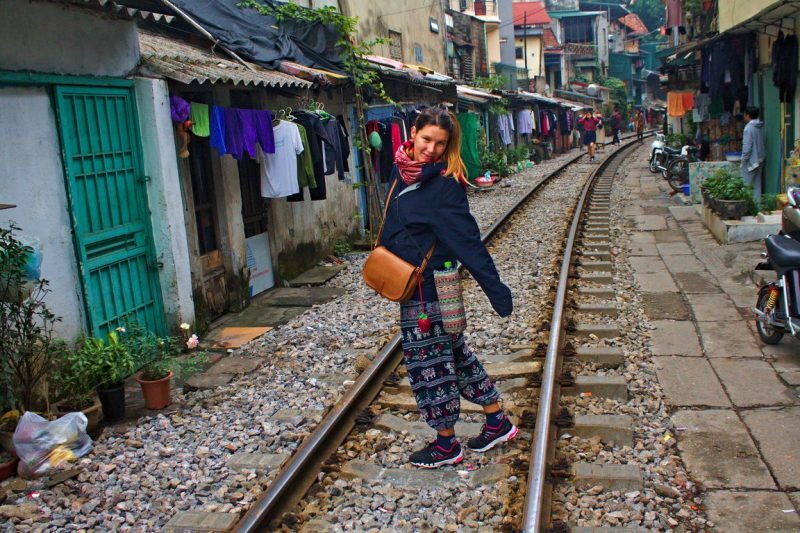 Do you know why the transport back to Hanoi from Cat Ba was half the price? On our way down to Da Nang, we didn’t really think it was worth stopping just for Phong Nha during a very rainy season. With better weather we may have chosen otherwise. We never planned very far ahead and just booked a train or a bus whenever we felt like going and we have no experience using a monthly ticket, it all depends on how often you will travel from place to place. Maybe you’ll like it somewhere and you’ll stay longer and you don’t want to pay for a ticket you won’t be using. One problem with buying tickets is the language: it’s not always easy to get the right tickets as a foreigner. There are plenty tourist-oriented shops that will sell you tickets, but they usually charge more than the official price. This is probably why we paid more for the bus to Cat Ba, we did ask around in Hanoi and our hotel sold the tickets the cheapest. In Cat Ba, there are not that many tourists (yet) and prices are still lower.